I created a site and purchased a domain, created 2 S3 buckets, set up my dns records(herein I think is the problem), uploaded my index.html file, my pics etc… but I can’t get to my site via the domain name nor the endpoint in my bucket, I can reach it via the url to my index. Html page. I have tried to include cloud front but later disabled it. Www.hattfund.net is my domain. Where are you hosting the domain? Who are your domain service? I am am using route 53 and s3. It seems that your domain name is not resolving to the correct ip yet. 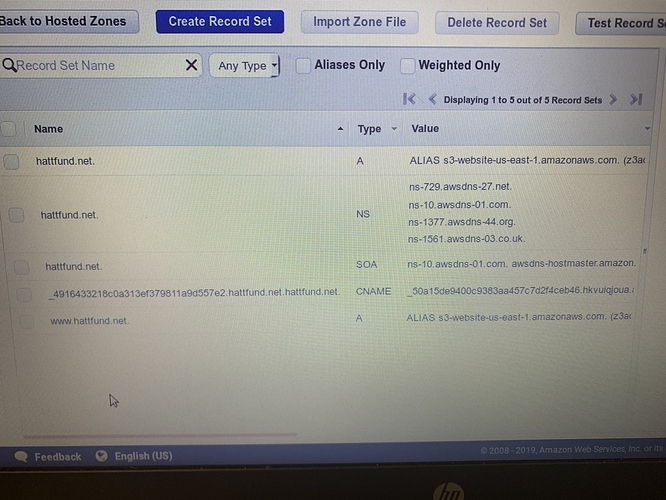 you may need to create/edit your record set on your domain hosted zone of your route 53, so that the entry name for both hattfund.net will point to an alias target of your s3 bucket. I am waiting for my DNS records to propagate but thus far the issues remain. Do you see any issues with the DNS records? I’m not sure if when I worked on the records yesterday something changed:(. It worked for me after I worked on the records but the when they propagated it stopped, ugh. Also wanted to say thank you for helping me work on this. So what I ended up doing was getting rid of my S3 bucket’s and creating a virtual instance with a Linux machine. Creating an Apache server. And then uploading my file to the Apache server. I may have accidentally put up the wrong version of the webpage. But it works. Now I just need to upload the finalized version of the webpage to my Apache server and all will be well. I appreciate all the help that I got from different people in the forum. Pretty rewarding feeling getting that first site up and knowing that it’s running and that you can access it from Hattfund.net or www.hattfund.net or from its IP address. Bro can you tell me how to start learning Aws ?? I figured out what I know from trial and error, if you have any specific questions feel free to ask. I watched a lot of YouTube and amazon has some good tutorials also. Sign up for the free tier and go make yourself a virtual machine(don’t lose the private key) and then watch how to make a server and execute a page, it is pretty easy. Have questions? Ask. Use ec2, I like it better than s3(buckets) but that’s me. Good luck! I have to learn aws lambda for my project, language used is Java. Can you please suggest some online courses which fulfills my need.